Happy New Year to all! Our energetic Youth Chairman, Katie Molodich was unable to attend our December meeting; she had surgery on both feet:  she did send a report with her mother, Betsy, that she can’t wait for March when the 2012 Drill Team will begin rehearsals! 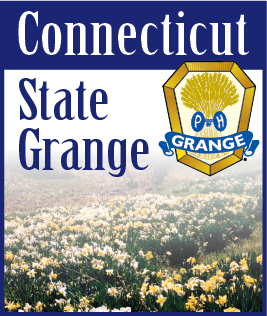 It was at this meeting that State Overseer, Jeff Barnes and his wife, Debbie, State Grange Pomona, were our guests and presented our Grange with a lovely certificate from the National Grange for placing 3rd in the nation for Community Service and a check for $200.00 to add to our treasury! Russell Gray delivered boxes at Christmas time to elderly Sterling folks: much appreciated! Our annual Holiday Bazaar was a great success with a hall full of venders, great food in the kitchen and naturally, Santa, to thrill the children! Mark your calendars for March 17th:  Corn Beef & Cabbage Supper; March 23-30 & April 6th Chowder n’ Clam cakes. All begin at 5 pm. We will vote at the January meeting concerning winter breakfasts. The 10th annual Sterling Community Calendars are in the hands of Sterling families and Robert P. Jordan, 75 year Granger and Past Sterling First Selectman, is in the center of the collage this year! We are taking orders for our homemade apple pies and apple crisps and sold several as of this writing. $10.00 each. Orders taken by Sue Gray. We are so proud of the accomplishments and talents of our Junior Grangers: a great group of terrific future leaders! Scholarships (from Ekonk) were presented to:  J. Allen Cameron, Sarah Cousens, Katie Hermonot, Colin Sebastian and Shelley St. Jean at the Christmas program. These outstanding Ekonk youth are all College students with excellent grades and a little help seemed the right thing to do (donor anonymous-in the name of Ekonk Community Grange-so no money was taken from our treasury). Spring will also find us visiting our good friends in Richmond, Rhode Island, taking them a program with the theme, “When I was President” and focusing on the 1920’s! Visit us on the hill anytime!